With the function of Siemens microcomputer control system, it is possible to control automatically start, stop. Automatic reverse sensors to protect the machine against over loading and jamming. The output capability typically range between 300kg/hr –5,000kg/hr+ depending on the different model and different materials. The cutting part of the Single shaft shredder - Zibo United Tech Machinery Co., Ltd. including the rotor, rotor blade, counter blade and the screen. The minimum mounting clearances between the rotor blade and counter blade is 0.1mm. The motor drive the rotor by high speed rotating trough the speed reducer, therefore the rotor blade cutting the counter blade. After one cutting, the materials will be discharged if its size smaller the screen mesh size. Or the material will be double or more cutting, until the size is smaller than the screen holes. Single shaft shredder - Zibo United Tech Machinery Co., Ltd.
Industrial Solid Waste: Cable; Light Metal, like Aluminum Can, Aluminum Scrap, etc. White Goods, like TV Shell, Washing Machine Shell, Refrigerator Body Shell, Computer Shell, Circuit Board, etc. Solid Waste, like Household Garbage, Medicinal Waste, Industrial Waste. 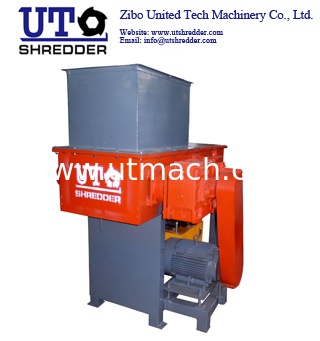 The United Tech machine is suitable to process very big size of waste furniture, such as fiber board or shaving board (particleboard) in furniture industry, timber harvesting, wood cutting remains (branc hes), wood processing remains(saw mill residue), waste wood pallets, and even other no wood material (reed, bamboo). 1. The machine with big feeding mouth, it can put the big plastic product freely. 5. The knife material is high quality tool steel, with long lifetime.